I was sorting some of my videos and photos of the Seabourn Sojourn Maiden Voyage and Inauguration this morning and thought I might give you a taste of what is to come. And a little discussion on why I am continually so impressed with Seabourn. Honestly, I was not prepared for the Inaugural Celebration to be as moving as it was, so at the last minute I pulled my mobile telephone from my pocket and videoed the last moments. 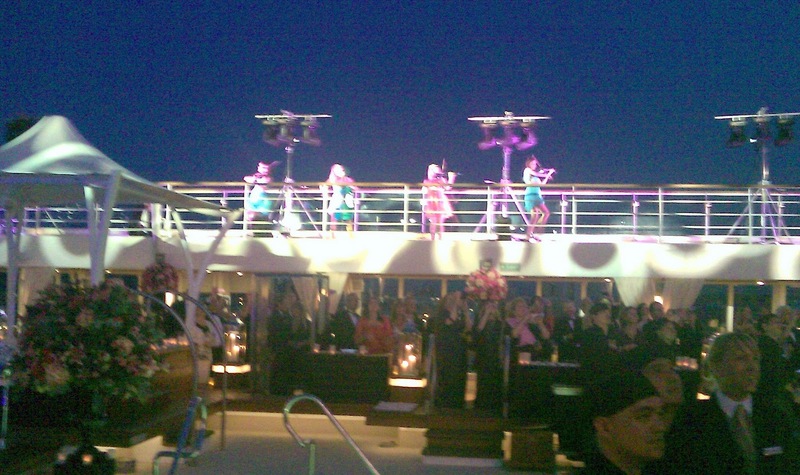 It isn't the highest of quality, but it hopefully will give you a sense of what "Seabourn Style" is all about. Now, I try to be fair and objective about things and this is a perfect example as to why I have so much more confidence recommending The Yachts of Seabourn over Silversea Cruises or Regent Seven Seas Cruises. If you recall Silversea's Naming Ceremony, it was a boring daytime affair with people seated in rows followed by a number of boring speeches. On the other hand, Seabourn put on "The Show"...and remember I haven't shown you the celebration for the Maiden Voyage Sailaway or the Seabourn Experience in Reykjavik as of yet. Open bars and service with a smile is just not enough. Gimmicks don't really do it. There needs, in my opinion, to be a "Wow Factor". I am confident that Seabourn will consistently continue to provide that Wow Factor. When was the last time you heard of being wowed on Silversea or Regent? Let me know...seriously and I will write about it.